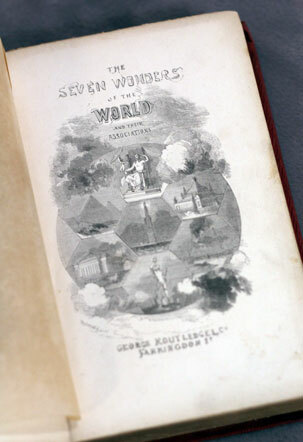 Publisher: George Routledge & Sons, 1854. Long out of print! Condition: Hardcover, red cloth. Some fraying of the spine ends, but good for its age. Well bound and intact. 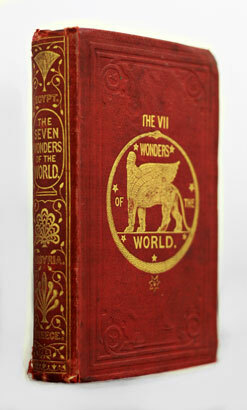 A lovely and odd and very interesting little book – they don’t write books like these anymore! was difficult to select the true from the fabulous. 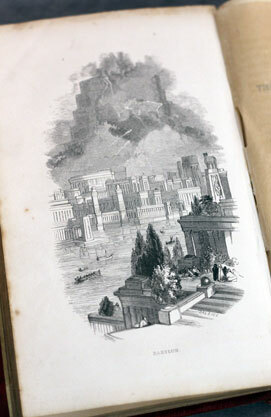 Herodotus's Account of the Pyramids. Egypt. The Approach from Cairo. The Interior of the Great Pyramid. Captain Caviglia's Investigation. The Ascent. The Second Pyramid, and its Ascent by Mi:. Wilde. The Third and Fourth Pyramids. The Pyramids of Sakkarrah and Dashour. 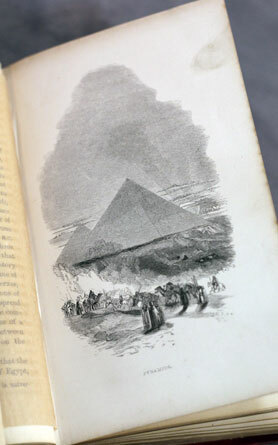 Graves's Pyramidographia. The Mexican Pyramids. Other Pyramujal Buildings. Suggestions for the Origin of the Name. Gardens of the Eastern Nations. The Statue. The Invention of Chryselephantine. Statues by Phidias. 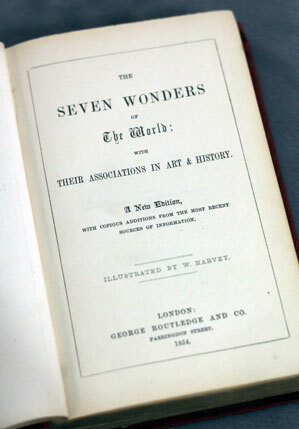 Phidias's other Works. The Statue of Minerva. The Temple of Minerva. The Greeks Athens. Temple of Jupiter at Athens. The Olympian Games. Pindar's Odes. Temple to Jupiter at Agrigentum and at Selin. Temple to Jupiter at Rome. Jupiter Zeus. Jufiter Ammon. Temple of Karnak. Temple of Jupiter Ammon. Ephesus. The Temple. Bishop Pococke's Remarks. Vitruvius's Descrdption. Diana Artemis Hecate. The Temple of Diana at London. Early Christian Churches were all erected on the   site of Ancient Heathen Temples. Diana as depicted in Homer. Diana as Hecate in Hesiod. 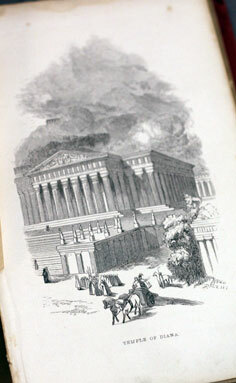 Ephesus and the Temple when visited by St. Paul. Mausolus and Artemesia. Halicarnassus. The Mausoleum. The Tomb of Cyrus. The Tomb of Darius. Alexander's Mausoleum to Heph;estion. The Mausoleum of Augustus. The Mausoleum of Hadrlin. The Tomb of the Scipios. The Tomb of Cecelia Metella. The Tomb of Maximilian. The Taj Mahal. Other Mausoleums in India. The Mausoleum to the Marquis of Rockingham. The Mausoleums at Castle Howaed, at Cobham,   and brocklesby. The Tombs of the Kings in Egypt. Alexandria. dlnocrates the architect. The Pharos. The Island of Pharos. Ancient Alexandria. The Ptolemies Founders of the Pharos. Dioclesian's Pillar at Alexandria. The Emperor Claudius's Pharos at Ostta. Tee Pharos of Cordouan. The Pharos at Puzzoli. The Pharos at Genoa, at Antium, and Ancona. The Eddystone Lighthouse. The Bell Eock Lighthouse. The Inchcape. 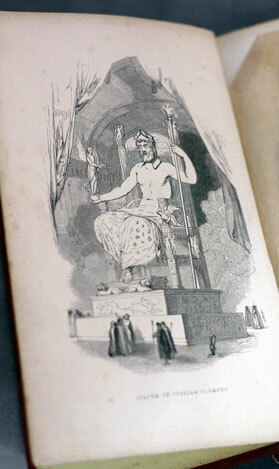 Early History of Rhodes. The Statue of Apollo. The City of Rhodes. The Pythian Games. Helius and Apollo. Worship of Apollo. The Oracles. Apollo and the Daphnephoria. Temples and Oracles of Apollo at Patara akd Delos. Pindar's Ode to Diagoras the Rhodian. Other Colossal Statues   In Egypt. In India. In Greece, etc.